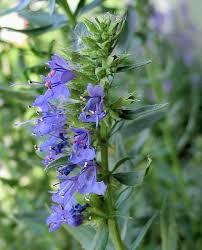 Hyssop is an aromatic, semi-evergreen, shrubby perennial that grows in an erect bushy clump. It is a highly ornamental plant with a long and extensive history in herbal medicine. It can be grown as ground cover but is also an excellent choice for a herb or rock garden. It's leaves and flowers are edible and the later are extremely attractive to a wide range of useful pollinators. It is easily grown in average, well-drained soils and likes a sunny position. To order this plant please contact us balkanecologyproject@gmail.com. An evergreen shrub growing to 0.6 m by 0.6 m at a medium rate. Suitable for: light (sandy), and medium (loamy) soils and prefers well-drained soil. Suitable pH: Nneutral and basic (alkaline) soils. It can grow in semi-shade (light woodland) or no shade. It prefers dry or moist soil. Leaves: Leaves have been and still are used in cooking to flavour stews and sauces. Medicinal: A long history. Considered antiseptic, astringent, carminative, emmenagogue, expectorant, purgative, stimulant, stomachic. Some studies have suggested the plant contains antibacterial, antifungal, antidiabetic and antioxidant properties. A very ornamental plant, which is very attractive to a range of pollinators. Thrives with regular watering, but established plants have respectable drought tolerance.